Microalgae are diverse in terms of their speciation and function. More than 35,000 algal strains have been described, and thousands of algal cultures are maintained in different culture collection centers. The ability of CO2 uptake by microalgae varies dramatically among algal species. It becomes challenging to select suitable algal candidates that can proliferate under high CO2 concentration from a large collection of algal cultures. Here, we described a high throughput screening method to rapidly identify high CO2 affinity microalgae. The system integrates a CO2 mixer, GasPak bags and microplates. Microalgae on the microplates will be cultivated in GasPak bags charged with different CO2 concentrations. Using this method, we identified 17 algal strains whose growth rates were not influenced when the concentration of CO2 was increased from 2 to 20% (v/v). 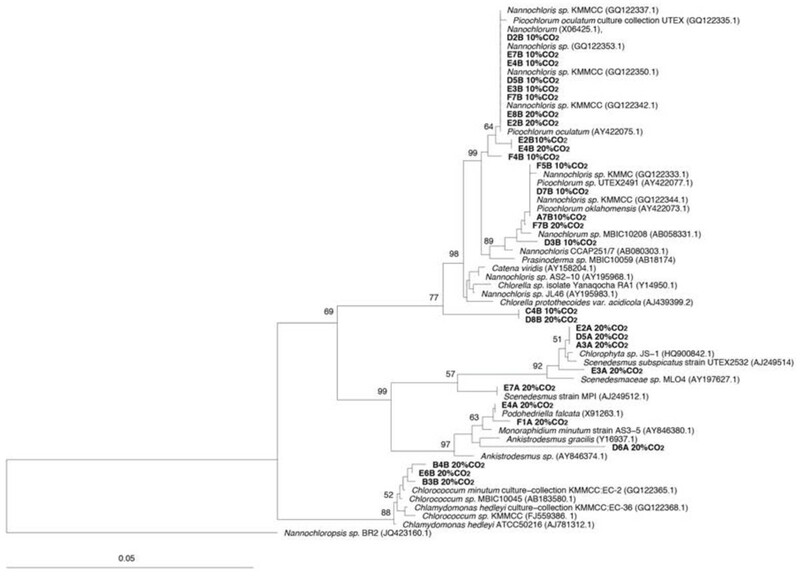 Most CO2 tolerant strains identified in this study were closely related to the species Scenedesmus and Chlorococcum. One of Scenedesmus strains (E7A) has been successfully tested in in the scale up photo bioreactors (500 L) bubbled with flue gas which contains 10-12% CO2. Our high throughput CO2 testing system provides a rapid and reliable way for identifying microalgal candidate strains that can grow under high CO2 condition from a large pool of culture collection species. This high throughput system can also be modified for selecting algal strains that can tolerate other gases, such as NOx, SOx, or flue gas. Increasing atmospheric greenhouse gas emission by human activities has been regarded as a major challenge of global sustainability. CO2 is a primary greenhouse gas, which makes up approximately 83.6% of the total greenhouse gas emission . Increasing level of CO2 causes global warming and the subsequent environmental issues such as the rising sea level and snow or ice melting [2, 3]. Biological fixation carried out by photosynthetic plants and microalgae has attracted increasing attention as an environmentally friendly CO2 mitigation strategy [4, 5]. Photosynthesis renews oxygen in the atmosphere while fixing CO2 into potentially useful biomass. Microalgae are emerging as a promising biological fixation system; each acre of microalgae is able to fix three to five times more CO2 than the same area of terrestrial plants . Meanwhile, microalgae are also able to remove nitrogen, phosphorus, and heavy metals from wastewater, and algal biomass can be converted into useful products, such as biofuels, nutraceutical products, animal feed and fodder for aquaculture [7–9]. Exhaust gases from power plants attribute to ca. 40% of the U.S. annual CO2 emission in 2010 . Earlier studies have reported that microalgae can be used to sequester CO2 in power plant flue gases [11–13]. The concentration of CO2 in power plant exhausts varies from 10-15% depending on the source of fuels . Therefore, the ideal microalgal candidates for sequestering CO2 in flue gases should be able to grow under CO2 concentration above 10%. It is known that different species of microalgae can tolerate different levels of CO2. For examples, it has been reported that Chlorella sp. and Euglena gracilis can tolerate up to 40% CO2, Chlorococcum littorale could endure 60% CO2, Scenedesmus sp. could grow under 80% CO2, and Cyandium caldarium were successfully grown under 100% CO2. However, it is difficult to evaluate and compare the actual growth rates of these algae under high levels of CO2 because some strains just tolerate but do not grow under high CO2 condition. Moreover, a comparison within the same species in different studies can also be challenging due to the different experimental setup. It has been reported that Scenedesmus obliquus can tolerate up to 18% CO2, but the optimal growth was observed with 6% CO2. It is also reported that S. obliquus grew successfully under 70% CO2, however, the highest growth rate occurred below 10% CO2. Nevertheless, in a separate study, the optimal growth of S. obliquus at 15% CO2 was observed . The inconsistency of these results may be caused by the difference in the experimental setup. Many earlier studies conducted the CO2 tolerance tests using flasks bubbled with certain levels of CO2. In this case, the actual concentration of CO2 that algae are exposed to is hard to monitor because a certain amount of CO2 can be lost to air due to bubbling . Difference in light, temperature, culture media and containments, bubbling rates, and other factors may all contribute to variable CO2 tolerance within the same species [21, 22]. Microalgae are diverse in the natural environment. It has been estimated that about 200,000-800,000 algal species exist in nature, of which about 35,000 species have been described [23, 24]. Thousands of algal strains have been isolated, characterized and maintained in different laboratories and culture collection centers. To select the candidates that have a high CO2 affinity from this large pool of algal collections can be very time-consuming and technical challenging, particularly when the growth of algae need to be measured. A high throughput method for evaluating the capability of these algal strains for CO2 tolerance could facilitate the research in algal sequestration of CO2 pollutions. In this study, we designed a high throughput system to select microalgae based on their CO2 tolerating capability. The system we described here includes a CO2-air mixture device that provide a desired CO2 level, and a DB GasPak™ EZ bags to hold the CO2 gas. Microalgal cultures can be dispensed into a 24, 48, or 96-well plate that will be incubated inside the GasPak™ bag. This high throughput system can also be charged with flue gas. It provides a high-throughput, uniform and repeatable method for CO2 tolerant strains selection and comparison. Using this system, we identified 17 strains of microalgae from our culture collection that can grow under 20% CO2 condition. The pH value of the medium is used as a direct indicator of the ambient CO2. To test the stability of GasPak bags for holding desired CO2 concentrations during the incubation time, we monitored pH in the wells of microplates over a two-day period. We monitored pH for 2 days because the GasPak bags will be opened for OD reading every 48 hours and recharged with CO2. The pH values in the medium dropped sharply and reached equilibriums within 2 hours after the bags were filled with CO2 (Figure 1). The value of pH reached different equilibriums depending on the percentage of CO2 charged to the bags, suggesting that the system is sensitive to a small difference in CO2 input. In all the treatments, CO2 levels remained relatively constant in 48 hrs, suggesting that the GasPak bag can provide a stable environment to test the effect of different concentrations of CO2 on the algal growth. When charged with same amount of CO2, the marine medium (SN15) was able to maintain higher pH values compared to the freshwater medium (BG11). For example, under 20% CO2, pH in the BG11 medium is 5.2, while pH in the SN15 medium is 5.7. It has been known that seawater is a good buffering system, and the solubility of CO2 decreases when the salinity increases . 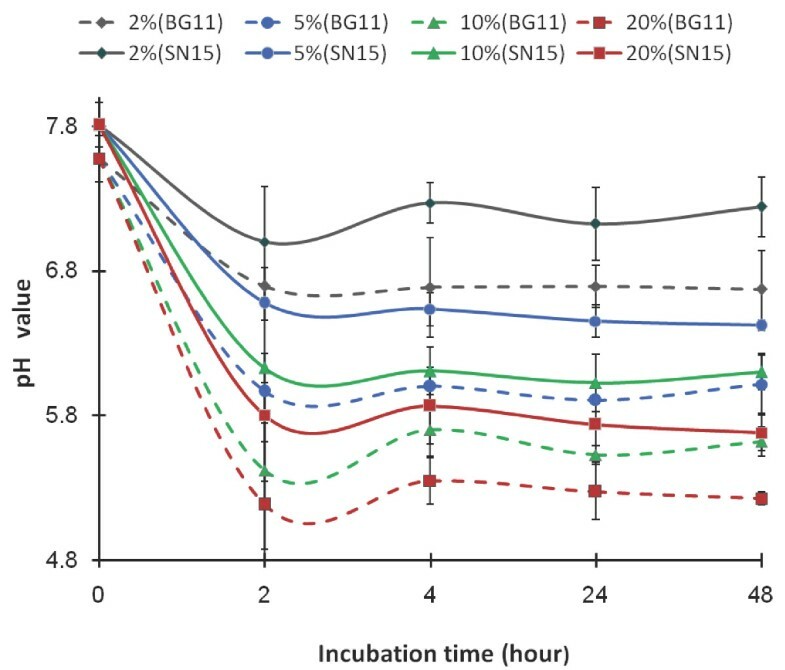 Time course of pH values of BG11 (…) and SN15 (—) medium after incubation in 2, 5, 10 and 20% CO 2 . The pH values were measured after the plates were exposed to different CO2 concentration for 2, 4, 24 and 48 hours. The GasPak bag system provides a uniform environment for testing many algal strains at the same time. After 14 days, distinct growth performance of different algal strains can be visualized (Figure 2). At the lower CO2 level (2%), nearly all the algal strains grew well and showed healthy green or blue-green color at day 14. The inhibition of growth was visible on many algal strains when the CO2 level increased to 10 or 20%. 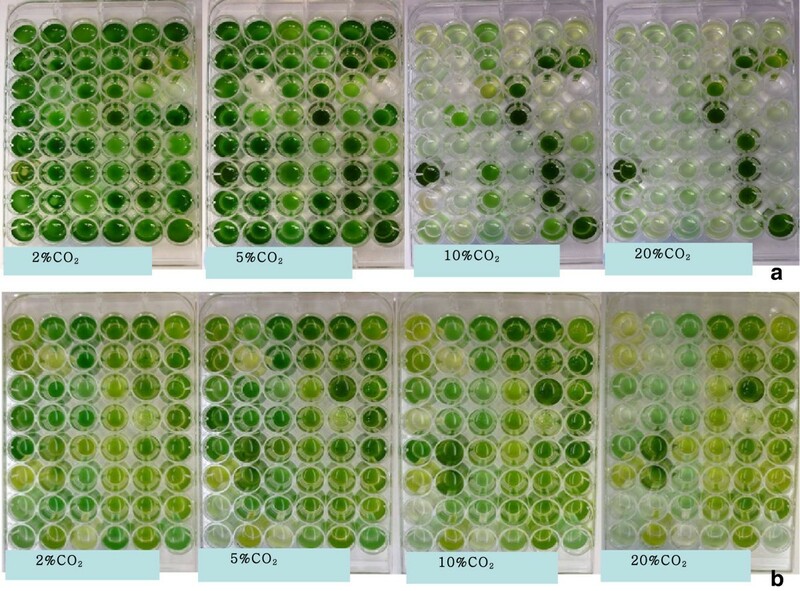 Top view of algal cultures in microplates after exposing to different concentrations of CO 2 (2, 5, 10 and 20% v/v respectively), (a) strains grown in BG11 medium and (b) strains grown in SN15 medium. Growing multiple algal strains in a 48-well or 96-well plate allows a quick measurement and direct comparison of algal cell density using a plate reader. Using the system we developed here, growth performance of all tested strains at different CO2 concentrations were monitored. The growth curves allowed us to compare and evaluate the tolerance capacity of selected algae under different CO2 conditions. 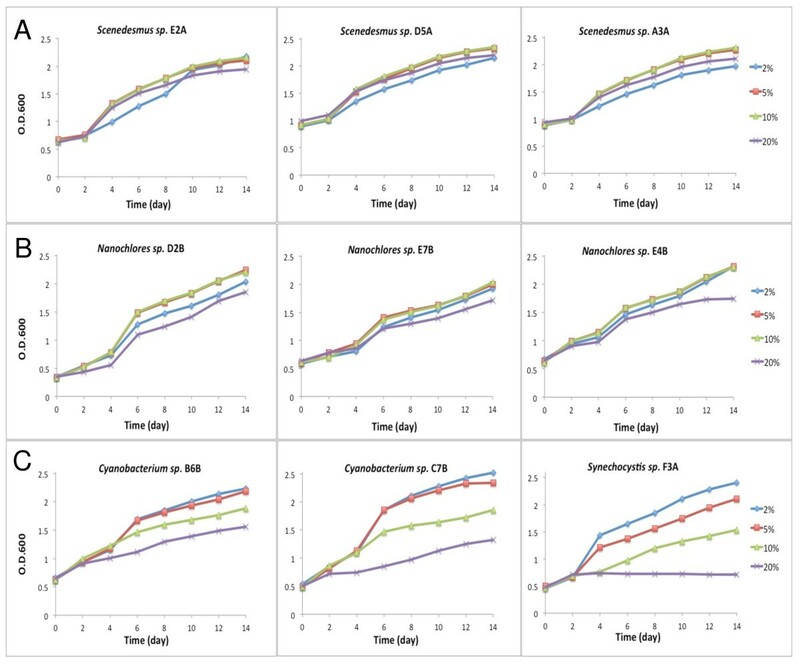 For example, three Scenedesmus strains showed a rapid growth under 4 different CO2 concentrations (2, 5, 10 and 20%) (Figure 3, panel A). The growths of these algal strains were not affected by increasing CO2 level (up to 20%), suggesting that they may tolerate even higher level of CO2. In contrast, the growths of three cyanobacterial strains were inhibited when the CO2 level was increased to 10 or 20% (Figure 3, panel C). The degree of growth inhibition increased with increasing concentration of CO2 suggesting that this system provides sufficient sensitivity for distinguishing algal strains capable of tolerating different levels of CO2. Time course of OD600 reading for algal strains under 2 (Blue), 5 (Red), 10 (Green) and 20% (Purple) CO 2 . Panel A Scenedesmus sp. E2A/D5A/A3A, Panel B: Nannochloris sp. D2B/E7B/E4B Panel C: Cyanobacterium sp. B6B, C7B and Synechocystis sp. F3A. The strains were named due to their location on microplates. Within all the 96 strains tested, 17 strains were able to maintain similar growth rates with CO2 concentration ranging from 2 to 20%, and these algal strains were considered to be high CO2 tolerant strains (Figure 2). The algal strains that only grew under 5% CO2 concentration were considered as CO2 sensitive strains and may not be suitable for the CO2 mitigation purpose. In general, the seawater strains tend to show better performance under elevated CO2 stress compared with freshwater strains. One explanation would be that seawater medium (SN15) is a better buffering system than freshwater medium (BG11), therefore smaller decrease in pH in the seawater medium poses less acidification stress to microalgae when both media are exposed to the same ambient CO2. The algal strains that can tolerate 10 and 20% CO2 were identified by sequencing the partial 18S rRNA gene or 16S rRNA gene. In this study, 5 strains of Scenedesmus and 3 strains of Chlorococcum can tolerate 20% CO2, and 10 strains of Nannochloris can tolerate 10% CO2. The majority of CO2-tolerating strains are closely related to Scenedesmus sp., Nannochloris sp. and Chlorococcum sp. (Figure 4). Three closely related Scenedesmus strains (E2A, D5A, and A3A) showed little effect on their growth when exposed to 2, 5, 10 and 20% CO2 (Figure 3, panel A). Growths of three Nannochloris strains (D28, E7B, and E4B) were slightly inhibited at 20% CO2, but were similar at 2, 5, and 10% CO2 (Figure 3, panel B). These results suggest that many microalgae in genera Scenedemus and Nannochloris can grow under high levels of CO2. Other studies have also reported that many algal species from these two genera can tolerate high concentration of CO2[5, 18, 21]. In contrast, tested cyanobacterial strains (B6B, C7B, and F3A) grew poorly under high concentrations of CO2 (Figure 3, panel C). Among the limited number of algal strains we tested, it appears that algal species from Scenedesmus, Nannochloris and Chlorococcum are good potential candidates for sequestering CO2 in power plant flue gas. Phylogenetic tree of CO 2 tolerant microalgae based on 18S rRNA sequences, Nannochloropsis is used as an outgroup. Bootstrap value = 100. The majority of the 20% CO2 tolerant strains formed several separate branches, represented by genera Scenedesmus, Chlorococum and Ankistrodesmus (Figure 4), suggesting that certain groups or genotypes of algae tend to perform better under high CO2 level compare with other algal groups. When more algal strains from diverse taxa were tested for CO2 tolerance, the phylogenetic information may provide a useful link to the potential of CO2 tolerance of algal strains in the future. One of Scenedesmus strains (E7A) has been tested in large photo-bioreactors (500 L) charged with flue gas (10-12% CO2), and it was able to maintain vigorous growth and consume the vast majority of influx CO2 (data not published). This test suggests that the algal strains selected using our high throughput system may be suitable for large scale cultivation. The GasPak system we demonstrated here is designed for high throughput selection of CO2 tolerant algal strains. Ideally, it would be useful to integrate a CO2 sensor into the system so that the actual concentration of CO2 in the GasPak chamber can be monitored. It is possible that the CO2 concentration in the chamber could decrease significantly as algae continue to grow over a longer period. Given the fact that algae showed consistent growth trends under different CO2 concentrations, we believe that the GasPak system is able to maintain desirable CO2 levels during the 2-week experiment. We introduced a high throughput system that can be used to quickly select microalgae or other microorganisms that can grow under different concentrations of CO2 or other type of gases. Our system provides an adjustable gas input and yields reproducible growth measurements. The growth performance of hundreds of algal strains can be compared at the uniform and sustainable condition using this system. In addition, the system can be used for high throughput screening for algal strains that can tolerate other gases, such as NOx, SOx, or flue gas. The algal strains used in this study were isolated from waters collected from different parts of the Chesapeake Bay including the Baltimore Inner Harbor and the Back River (Baltimore, Maryland), using agar plates made of BG11  as a freshwater medium and SN medium  as a seawater medium. Single algal colonies were picked and transferred to 96-well plates, and scaled up to large culture flasks. The algal cultures were illuminated continually using the plant light (Agro-Lite R20, 50 W, PHILIPS) at 25μE/ m2/s. This light level was carefully selected for growing algae in the small volume of 48 well Costar plates (Coring, NY, USA). Considering the low starting algal density and the amount of photon received by individual cells, the light intensity in this setting is within the appropriate range. To set up different concentrations of CO2, pure CO2 and air were blended using a device with two gas flow meters (Figure 5). System used for charging specific concentration of CO 2 to the GasPak bags. For instance, to generate 10% (v/v) CO2, the flow of pure CO2 was set at the speed of 1 L/min using the controller on the right hand side and the flow of air was set at a velocity of 9 L/min using the controller on the left hand site. The CO2/air mixture was then used to inflate the GasPark bag as shown. In order to test the stability of CO2 concentration inside GasPak™ bag (Becton Dickinson, NJ, USA), one milliliter of BG11 or SN15 medium was added to individual wells on a 48-well microtiter plate. Four identical plates were prepared and placed into 4 GasPak™ bags which were charged with 2, 5, 10 and 20% CO2, respectively. The pH values in the culture media were measured at 2, 4, 24 and 48 hours, using an Accumet Basic pH meter (Fisher Scientific). Only culture media (no algal inoculation) were used in this test, and the same experiment was repeated 3 times. 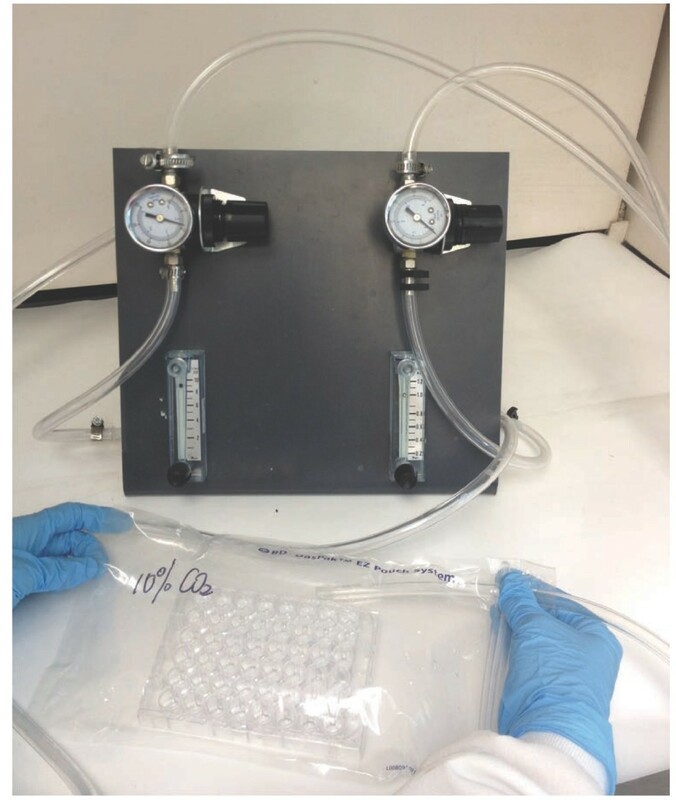 A 48-well-microtiter plate (without lid) that contains multiple algal strains was placed inside a GasPak™ bag and the bag was aerated with desired concentration of CO2. The sealed bags were incubated with light at 25μE/ m2/s. In this experiment, different algal strains were dispensed into 48-well plates and charged with 2, 5, 10 and 20% of CO2 respectively. The growth of algae was monitored by cell density (OD600) every other day using a multi-mode microplate reader (Molecular devices, SpectraMax M5). After reading, the culture plates were placed back into the bags, and the system was re-charged with desired concentration of CO2. Genomic DNA of selected strains were extracted and 18S or 16S ribosomal RNA gene was amplified using the universal primers for eukaryotes and prokaryotes, respectively . Phylogenetic trees were constructed based on partial 18S or 16S rRNA gene sequences using ARB Neighbor-joining algorithms with 100 bootstrap . Comparison was carried out between selected strains from this work and high CO2 tolerant species reported from other studies. We thank Robert Mroz and Jack French for providing the unpublished data on the scale up cultivation of Scenedesmus sp. We also thank Odi Zmora and Mathew Moore for helping the design of the CO2 mixer. The funding from Maryland Industrial Partnership supports this work. Experimental design: FC, LZ. Performing the experiments: LZ FZ. Data analysis: FC LZ FZ. Manuscript preparation: LZ FC FZ. All authors read and approved the final manuscript.